Don't use standards- noncompliant products like IE. Better yet, don't use any MS products! 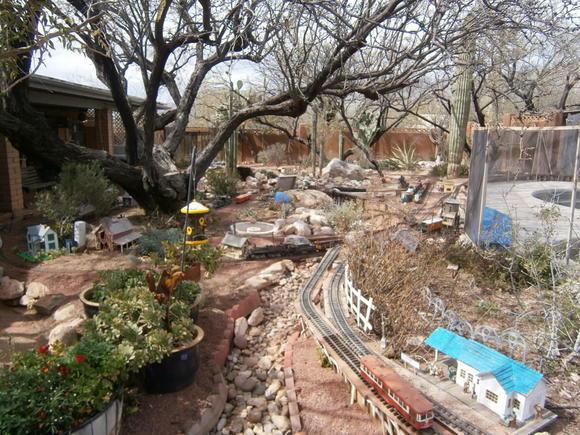 March 8 2019: Last weekend was the annual home tour of the Tucson Garden Railway Society. Most of the sites we had seen on previous tours. They still do not fail to amaze. The Eagle Mountain Railroad is about the largest. Occupies the entirety of the lot outside the home. Elaborate concrete butte models, many automated vignettes with pushbuttons for visitors, a lengthy river springing from the fake mountains. Wow. An elaborate setup at a home near Agua Caliente Park on the far east side. The owners also operate a Bed and Breakfast with the "bed" part inside an old Southern Pacific caboose. They are getting pretty old, and I can't help thinking how much of their lives have been poured into their train set, and what will become of it when they're gone. Next weekend, March 16, is the celebration of the 139th anniversary of the arrival of the Southern Pacific Railroad in Tucson sponsored by the Historic Depot (apparently a division of the Old Pueblo Trolley organization). 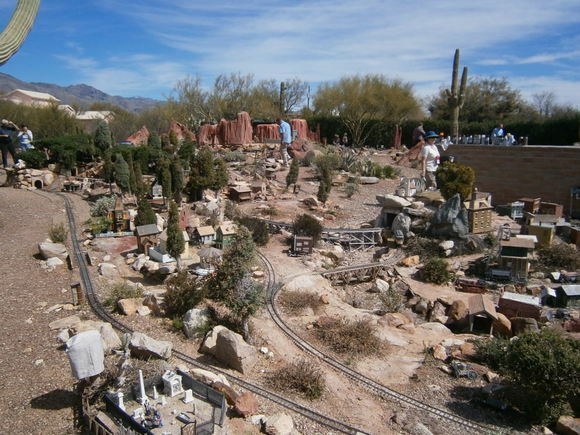 I'd forgotten about the Tucson model railroad club - the Gadsden Pacific Division. I also was reminded through Tucsontopia that Tucson has an old car museum, the Franklin Auto Museum, dedicated to the Franklin company that went belly-up in the Great Depression. Funny that this sort of thing would be in Tucson. There's a Franklin Car Club, and another, apparently more elaborate museum, the Gilmore Car Museum at Hickory Corners, Michigan, with a sizeable collection of Franklin autos. Links for the Tucson attractions have been added to the Arizona Page. February 10 2019: PC GEOS is one of a few honest-to-goodness GUI environments for DOS. According to this site, PC GEOS has been released as Open Source, apparently as Apache 2.0. However, it seems that there is a problem with building it, and while it would be a great addition to the upcoming FreeDOS 1.3 release, it cannot be included until built as an Open Source binary. This "Virtually Fun" site seems fairly interesting. Here's another cool entry with a C versus OO parody video. Pretty silly. Galaxion is (was) a pretty good webcomic that looked promising, but it appears to have been abandoned. So it's off my list. 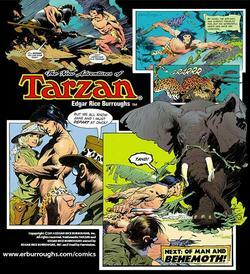 Replaced with the Official Edgar Rice Burroughs site, which even though it's by paid subscription is well worth it. February 6 2019: Got a tip pointing me to a stock of second-source TMS9900 processors! Looks like Excess Solutions (San Jose - Silicon Valley) might be a good one to add to my Surplus list. February 2 2019: I got to attend the Consumer Electronics Show in Las Vegas with the Marcus Engineering team a few weeks ago, and to also see some of Las Vegas with them. I finally finished my travelog, here. January 30 2019: MIPS goes open-source. I found a link found in a Microchip forum about whether the MIPS-based PIC32 line would at some point be discontinued in favor of the ARM-based SAM series inherited from Atmel. I wondered this myself when I was learning embedded Linux techniques on Atmel SAMxxx at the Microchip Masters last year. I don't mind ARM, but I am leery of another monoculture like x86. I'm kind of looking forward to RISC-V. But I've always cheered for the underdog, and MIPS is it (being practical, not counting large-scale PowerPC or Sparc). I found this article about why young people are hanging up on Christianity. The summary: Apologetics and Creationism are not being taught in our churches and families. Which is exactly what Answers in Genesis discovered. Updated the AZ page by adding the Mercado to the list of Shopping districts, and Last Fridays and Second SundAZe to the downtown events. Also added the newest addition to the El Charro family of downtown restaurants - Charro Del Rey, which appears to be oriented at seafood. I was puttering around on the southwest side this Wednesday, taking Valencia to its end (at Ryan Field) and back on Ajo (State Route 86). I discovered another Centennial sign on Ajo near La Cholla, which I have added to my collection. Of significant note is the addition of Monsoon Chocolate. I haven't actually been there, but it has been successful as Tucson's chocolatier for more than a year, so I have high hopes. They seem to be more narrowly focused on the "artisanal", so I suspect they aren't going to get Cerreta's big. October 26 2018: I came across (via KVOI) an editorial by Dennis Prager about the lack of passion in young people. I don't think he was considering political or social activist passion which younger people seem to exhibit (or at least the news media seems to portray), but rather professional passion. Ambition. I have had the honor of working with four younger men who are most definitely filled with electronics and engineering passion, and I have been amazed at what they can do when they are enabled and encouraged to apply that passion, both in a work and hobby settings. Therefore, I know it isn't just "young people" who are perhaps "coddled by parents and by society", as Prager puts it, or recipients of participation trophies. I am not familiar with the family patterns or upbringing of my young co-workers to a great extent. I only see what they are doing now. By way of counterpoint, however, this Road and Track article explains why passion may not be so important in selling cars. Sales jobs are fairly menial, and potential customers of sales people usually come to the market with a good notion of what they want and don't need to be sold on the features of the product. But engineering is not sales, and passion is important, perhaps indispensable. I've played with SQLite some. I am also aware of the trend nowadays for open-source projects to have "Codes of Conduct" (COC) to regulate the interactions of the developers on a project. It was funny to learn that the SQLite founder, when he was expected/required to include a COC to the project, picked the Rule of St. Benedict. No, he doesn't appear to be religious. But there was a Social Justice Warrior reaction of religious fervor that he hadn't given special consideration to "marginalized people". October 21 2018: It seems that there is a group in Tucson intent on bringing back the drive-in movie theatre. They are fundraising by having drive-in movies using an inflatable screen, but the intent is to secure land and put up a real screen and concession stand. The IPCC has seized the spotlight with the latest horrifying prediction of irreversible global doom unless we grant governments the power to destroy our economies and standard of living in order to stifle global warming-inducing carbon dioxide emission. That's the point of this FEE article that underscores the danger of entrusting "intellectuals" with the power to "save the planet". We've seen that before. It hasn't worked yet. Maybe there's global warming going on. With all the cherry-picked data and scientific scandal going on and the government grant money being grabbed at, it's hard to tell what the honest story is. Maybe human industry contributes. With the inclination to disregard, even denounce any counter-theories (like solar action) as being "anti-science" or "denialist", again, it's hard to make a balanced assessment. Maybe the results of global warming would be catastrophic. Or maybe they would be beneficial, like they were during the Medieval Warm period. The hair-on-fire projections are being made with unvalidated computer simulations. I deal in computer simulations. You can't just trust what they say, and even what they say has to be interpreted. But even if there is global warming going on, and humans are causing it, and it will have terrible effects on the world, expecting governments to fix it is insane. Every. Single. Time. Governments try to fix something, they never fix the problem, and they always introduce unanticipated side effects that are always worse than the problem was they were trying to fix. October 3 2018: Updates on the AZ page. A bunch of new restaurants downtown. Downtown is hopping, and it's a pleasure to drive through it every morning and evening to and from the job. August 27 2018: Gervase Markham has died (via LWN). 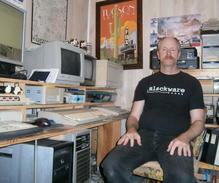 He was a prominent developer for Mozilla and well-respected by his peers and the Free Software community. He was also a Christian Geek. I corresponded briefly with Gervase on the subject of Christian faith and found him both orthodox and reasonable. Of course, some other hackers were not so pleased with his positions. https://blog.lizardwrangler.com/2018/08/07/in-memoriam-gervase-markham/ - "publicly judging others in politely stated but damning terms"
I've known some Christian professionals who made a pest of themselves by making their faith positions very public and/or taking to extremes the usual evangelical imperative for "soul-winning". Some have gotten fired for it, and I can't help but think that they asked for it. Hard to be sympathetic with brothers like that. I don't know if Gervase was like that. But I also know that, any more, it doesn't take much at all of making your faith position known to draw the displeasure, even the hatred, of those who are more appropriately aligned with the spirit of the age. June 27 2018: Last October, we (as usual) enjoyed Modernism Week. This time, we actually did the Trailer Tour: several camping trailer enthusiasts had set up their vintage trailers for guests to inspect. Big small-apartment trailers. Little "campstove on the back" trailers (cute). Tent trailers (like my family had when we camped in such places as Buffalo, NY, and Needles, CA (fun, fun, biting marsh flies, fun)). And a beautiful 1935 Bowlus Road Chief. The Bowlus trailers were the antecedent to the famous Airstream, even though only a very small number was made. Turns out that some outfit is making a NEW Bowlus Road Chief! Updating the chassis and interior appointments to 21st Century standards while retaining the 1930s look-and-feel. At $137,000, it's a bit pricey, though. Nice Road Chief website with lots of photos. June 24 2018: I've been playing with some system-on-board devices as alternatives to the Raspberry Pi. One that I really like, that is not unusably microscopic but has a nicer footprint and more I/O and built-in flash memory is the $9 iC.H.I.P.. Unfortunately, it seems that NextThing overextended themselves with their $9 basic model, let alone the $16 Pro model, and may have gone under. Since the C.H.I.P. is Open Hardware, it is possible yet that some enterprising hacker(s) may produce them on their own - won't be $9, but they may be available. Hope springs eternal. RasPad : Fully-assembled unit based on Raspberry Pi 3B+. Looks to be larger than a "handheld computer", but preserves access to all SOB ports. Still a Indiegogo startup project, so not actually available yet. Noodle Pi : Actually, the housing for a do-it-yourself project along with instructions for obtaining the parts. Based on the Pi Zero. The developer appears to live in Canada and accepts only transfers or Bitcoin. Poco Zero : Finished product by a UK hacker. Based on Pi Zero (obviously). Very small, very much oriented to video games (like the PocketCHIP). No I/O other than USB. Ark : Based on Raspberri Pi Compute Module. Open Hardware, and not a kit or finished product; looks like it's a circuit board fab project, and no mention of a case. Not sure it's quite there - probably the PocketCHIP has a better shot. It seems to be pushed toward "democratic" (leftist?) political activism (but nobody profits from it, so it's just a tool for anything). Via our city councilman's newsletter, I came across the news that a development firm is planning a multi-purpose building to replace the run-down apartment building on the northwest corner of Speedway and Campbell. This is fine by me. The replacement of the Rondstadt Transit Center downtown is fine by me. I'm not so thrilled with all the high-rise student housing going up, especially what's planned around the Benedictine Convent on Country Club or on Fourth Avenue (although THAT one would make the trolley people happy). Although, probably, the "residence" part of this tower would almost certainly be students, the literature doesn't say it's intended for that purpose. On the Arizona page, updated the restaurants lists (downtown, Tucson Originals) for places added, dropped, or we (at least I) have been to. I'll have to say, as someone who appreciates barbeque (a taste enhanced by many visits to Huntsville and Dallas), Brother John's on Stone doesn't stack up on barbeque to a place like Red Desert (about as close to my workplace on Grant as Brother John's is). March 4 2018: I was looking forward to the Davis-Monthan air show this year (every other year on even-numbered years). However, it seems they have come to an agreement with Luke AFB regarding Arizona air shows, and therefore DM is switching to odd years. That means this year's show, on the weekend of the 17th, will be Luke Days at Luke Air Force Base, one of the bases equipped with F-35s. We are thinking of going there this year (it being up on Phx, probably won't ever go but once). Strangely, the Navy's Blue Angels team will be flying at Luke this year, rather than the USAF Thunderbirds. What inspired me to look this up? Every so often, air show pilots (Air Force and civilian) practice flying in formation with modern jet aircraft and World War II aircraft. They're doing that this weekend! I've seen flights of F-35s with P-51 Mustangs and P-38 Lightning and F-86 SuperSabre airplanes. It's like having an airshow from my backyard!